Fox Sport’s Ken Rosenthal reported last night that the Twins were nearing an agreement with pitcher Jason Marquis to fill out the remaining open slot in the rotation. Now, in 2010, with a combination of JJ Hardy and Orlando Hudson patrolling the middle of the diamond, this might have been significant “get” for the Twins. Comparatively, last year’s model was nowhere close to the ’10 version. The more recent model managed to convert 73.1% of all grounders into outs which wound up being the worst conversation rate in all of baseball. Yes, the Twins did bring in Jamey Carroll this winter to cut down on the amount of blatant mistakes made by the ’11 shortstops but at his age, his range is far from being someone able to elevate a ground-ball pitcher’s game. 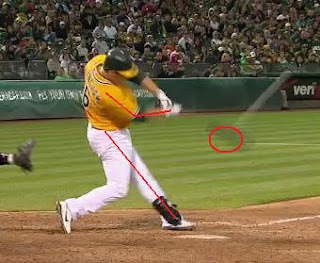 While singles through the hole are not the source of major damage, we’ve seen what it can do when a pitcher has to throw more pitches, with more runners on base and gives the other team opportunity to connect with a big blast. What exacerbated this problem further is that the entire staff (with the exception of Scott Baker and Francisco Liriano) was all cut from the pitch-to-contact clothe. The Twins rotation only struck out 14.8% of batters faced – second-lowest only ahead of Pittsburgh in 2011. Because of this woeful ability to avoid contact, the presumption was that the rotation needed to inject someone with a power arm capable of registering strikeouts. Unfortunately, Marquis does not help fit this bill at all: Since 2008, he’s 12.4% strikeout percentage has been the eighth-lowest in baseball. Likewise, the Twins have long favored control artists, those that eschew walks and force hitters to put the ball into play. While Marquis gets plenty of in-play results, he is actually a bit on the erratic side when it comes to not allowing walks -- issuing free passes in 8.6 percent of plate appearances. Combine this abnormally high walk rate (for a control-based pitcher anyways) with a low strikeout rate and Marquis owns the second-lowest strikeouts-to-walk rate dating back to ’08 (1.44 K/BB). Many probably want to compare Marquis to Carl Pavano based on their similar styles, peripherals, contact rates and batted ball results. Judging solely on those traits, yes, Marquis and Pavano are quite similar. The significant difference is what kind of pitches the pair get hitters to put into play. Since 2008, Pavano has been the foremost expert at getting hitters to chase after his pitch out of the strike zone (he’s gotten 33.9% of all out-of-zone pitches) meaning opponents are putting more “bad pitches” into play. In that same time, Marquis has been the fifth-worst in baseball at getting opponents to stray after pitches (just 25.7% swing rate at all out-of-zone pitches). Only Livan Hernandez, Brad Penny, Trevor Cahill and Aaron Cook have been worse than Marquis. 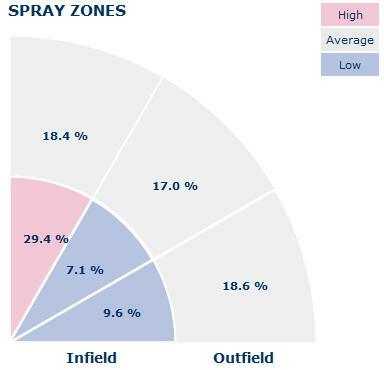 To summarize: When Pavano misses the zone, he gets hitters to chase. 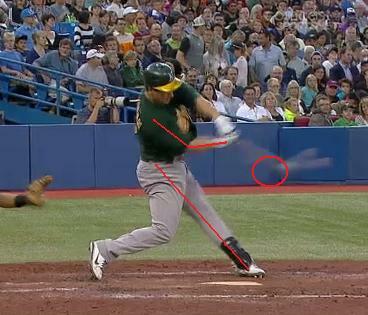 When Marquis misses the zone, hitters hold and frequently draw walks. Those are the essential shortcomings for the Twins in signing a guy like Marquis – he doesn’t fit the defense personnel (one that might be better at catching flies), could bring down the strikeout rate and walks a high proportion of hitters. On the other hand, Marquis is fairly consistent when healthy and able to throw over 190+ innings. (His season-ending injury in 2011, a fractured fibula courtesy of an Angel Pegan grounder off the leg, does not suggest that he will have any problems staying healthy in 2012.) The Twins need some stability in the rotation and reduce the need for the bullpen (which already figures to be fairly weak in depth). That’s about the best thing you can say about Marquis – he can provide stability – outside of that, do not anticipate too much. Addendum: The bone chips which required surgery in 2010 does raise a bit of a red flag. In 2010, then with the Washington Nationals, Marquis was experiencing discomfort in his elbow. He attempted to rest and rehab through it but during a rehab start bone chips in his pitching elbow flared up and he decided to move forward with surgery. Like Nathan, Baker and Blackburn before him, it is possible that Marquis might eventually run down the same path where the trio of Twins needed additional time on the DL or, in Nathan’s case, Tommy John surgery. However, his pain-free 2011 season may be an indication that the bone chip issue did not or possibly will not reoccur. After engaging in a waiting game with corner outfield incumbent Michael Cuddyer, the Twins appear poised to move on to the next option in Josh Willingham. As both Phil Mackey and Aaron Gleeman pointed out yesterday, the decision to move from Cuddyer to Willingham isn’t just based on their performance but also the additional picks that come with allowing Cuddyer to walk. From an organization-building standpoint, landing two free draft picks is a wise decision in and of itself. Then, on top of that, the team is able to sign Willingham for $3M less overall than the offer to Cuddyer (which may even be $7M in savings if Cuddyer gets his $30M that has been floated out by several national writers). It all adds up to the right move by the Twins decision-makers. What’s more, despite having similar offensive production the past two seasons, there is another advantage to signing Willingham if you consider his style might be better suited for Target Field. 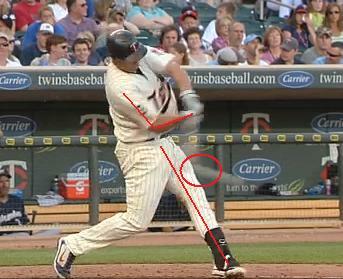 “Target Field changed my whole field of hitting. I usually tried to use the middle of the field, and if I pulled, I pulled, and if I went the other way, I went the other way. As it turns out, Young was correct. Most of the home runs hit at Target Field by right-handers were pulled, a dozen were hit to left-center, five to center and just three went opposite field. This was a huge drop-off from production at the Metrodome when right-handers had 20 home runs to center and right field in 2009. If the Twins were going to get a right-hander with home run power, they would need to acquire a pull hitter to thrive at Target Field. 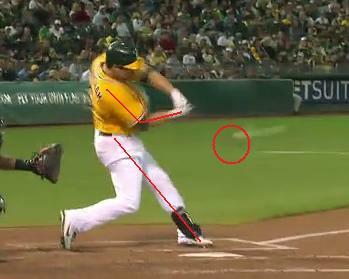 That’s where Josh Willingham comes in. 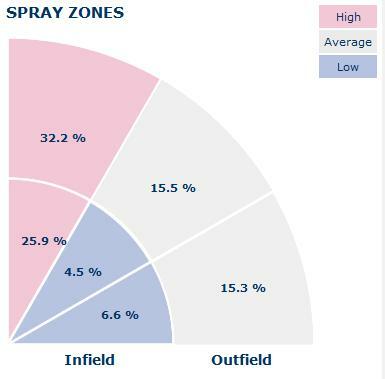 As you can see from his spray chart taken from the past two seasons, Willingham favors yanking the ball down the line – and this method has paid dividends for the 32-year-old outfielder. Over the past three seasons his weighted on-base average has been the seventh-best while his isolated power numbers (ISO) have been the fourth-highest among qualified hitters. Willingham’s pull-power served him well last year in Oakland where he slugged a robust .523 at the O.co Coliseum (O.co? We’re coming very close to having something named “Preparation H Arena” as seen in BASEketball, aren’t we?) when all right-handers only managed to .363 (only eight other stadiums were tougher on right-handed hitters in baseball last year). By comparison, righties compiled a .417 slugging percentage at Target Field. 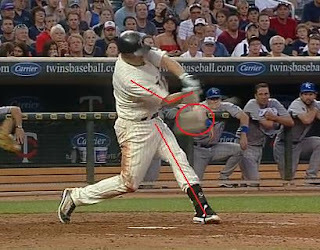 In addition to making contact out in front, Willingham draws his power from a stiff front leg which helps with leverage and keeps his hands inside as his back arm stays close to his body at a little over a 90 degree angle – otherwise known as the “Power L” position. This combination, plus his natural strength, has led to a home run every 18.6 at bats since 2009. In theory, this package should play much better within the home confines as opposed to Michael Cuddyer’s approach of using the entire field. Cuddyer, a strong individual in his own right, allows pitches to get much further into the zone and therefore winds up with a much more even distribution of hits to all fields. As such, the vast majority of his home runs also have left the yard in the left-center gap – a more difficult act to do on a regular basis at Target Field – versus close to the left field foul pole where Willingham’s home runs land. This isn’t to say anything that what Cuddyer is doing is bad, per se; it’s just the way he’s designed. Of course, these are just examples as he certainly does hit some out in front that travel a long ways but overall, he thrives on being the type of hitter that can poke an outside pitch to right or send one back up the middle. For Willingham, that’s basically unheard of. While it may have been Cuddyer’s attempt at a polite kiss-off by not accepting the offer, it could end up doing the team a huge service by giving them two draft picks, payroll relief and a player better suited for Target Field in Josh Willingham. DiamondCentric has teamed up with tkTwinCities, a website dedicated to giving 20-somethings all the local happenings, to giveaway free DC t-shirts to their readers. First, read my piece on how we started DiamondCentric and our unintentional guerrilla marketing tactics on the tkTwinCities.com website. After that, log on to Twitter and tweet why you want or need a free shirt with the hashtag #tkTC. Three winners will be selected. If you don't win, remember, we have a $15 sale now through Christmas on all Game Six, The Killer and Nothing Runs Like Revere shirts.